Is Using Ordinary Portland Cement in Building Industries Sustainable? 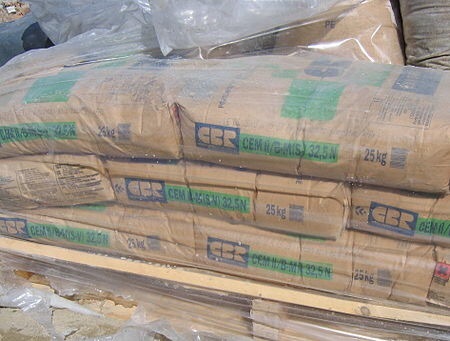 Ordinary Portland cement “OPC” is the most common type of cement in general use around the world by being a basic ingredient in building industry, e.g. concrere, mortar, stucco and most non-speciality grout. It is a fine powder, typically produced by heating materials, e.g. alumino-silicate clay-materials and limestone, at very high temperatures in a kiln, along with small amounts of other materials. It is essential in many construction around the world as concrete is one of the most versatile materials in this context. The low cost OPC, and widespread availability of other naturally occurring materials used in Portland cement, make it one of lowest-cost materials widely used throughout the world. Portland cement is caustic, can cause chemical burns, irritation or with severe exposure lung cancer. It, also, contains some toxic ingredients such as silica and chromium. Environmental concerns are very high energy consumption arising from mining, manufacturing and transportation of the cement and the related air pollution including the release of enormous amounts of green-house in particular carbon dioxide. Other amouts of environmental hazard involve dioxin, nitrogen and sulphur oxides as well as fine particulate dust. “Sustain-earth.com” will expand on detailing the environmental and climatic threats of OPC and the emerging sustainable techniques and friendly materials with more environmentally, economically and socially beneficial values. This entry was posted in Economy & Investment, Education & Research, Energy Resources, Environment & Climate, Health & Fitness, Human Resources, Politics & Infrastructure, Protection Instruments, Public Awareness, Technology & Industry, Transport & ICT, Urbanization & Household, Water Resources on May 1, 2015 by farideldaoushy. Dr. Farid, it is good approach sustain-earth.come to highlight such important topic related to construction and building industry. I would like to add that: Concrete consist of aggregate:( fine & coarse); admixtures; water & cement. The cement content of about 300 kg per cubic meter of the concrete. The cement industry contribution is about 5% of global CO2 emission; generally to produce one ton of cement one ton of CO2 is emitted to the atmosphere! In addition to other environmental impacts related to quarrying of raw materials…etc. Due to the availability of cement raw materials (lime stone, clay, bauxite & iron ore) the industry is “sustainable” from manufacturer point of view. The main issues related to construction industry is not limited to cement industry emissions, but also related to the availability of aggregate especially sand in addition to the durability and sustainability of concrete which effect the lifetime of the construction. With the increase of public environmental awareness the term “green building” which refers to a structure and the use of processes that are environmentally responsible and resource-effective throughout the building’s life-cycle as a whole product (http://en.wikipedia.org/wiki/Green_building). 1-increasing the efficiency of production units to decrease CO2 per ton of cement to around 540 KG! 3-conducting researches to produce alternative cementitious materials which fully substitute portland cement in the concrete; some of these products are currently available in the markets but the quantities are not enough to cover the construction market’s needs. Portland cement is not the best option for concrete. The cement had amount of Cao 3 times than Sio2, thus we had more than 40% SiO2 without reaction. OPC alone had wekker C-S-A-H.
Local Green concrete with more pozzolans or slag and less OPC will give us the best solution for the durability and sustainability. C-S-A-H is very good reaction that will reduce the porosity and permeability of green concrete. Moreover, Green concrete with pozzolans will improve the chemical and physical properties of the green concrete. The use of Lime will be better option to make concrete because the carbon footprint for the production of Lime will be 50% less than OPC. CEO of the Green Quality Company ltd .